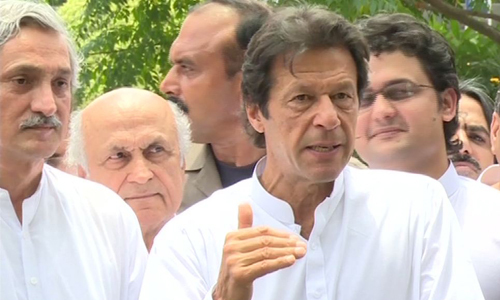 LAHORE/ISLAMABAD (92 News) – PTI chairman Imran Khan has said that it has proved that the 2013 election was unfair. Talking to the media in Lahore on Monday, Imran Khan said that the country would progress whatever the judicial commission verdict would be. “Rigging would have not been exposed had judicial commission not formed,” he said. He said that 93,000 votes were not identified in his constituency. Earlier talking to the media in Islamabad, PTI chief Imran Khan said that there is no data of 25 million votes and it seems that all are in collusion with the PML-N. He said that the Election Commission had earlier said it had all the material, but later said they had no Form 15. “Record rigging was committed in the general elections. The N-League government is being saved over rigging,” he said. The PTI chairman said that Form 15 had been disappeared from Balochistan. He said that they would have not staged a sit-in had they started investigations into four constituencies.